Ted Koppel who is an investigative reporter investigated the vulnerability of the US power grid to an attack. 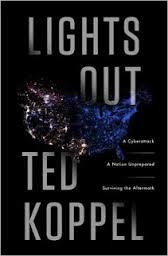 In Lights Out Koppel makes the case that the U.S. electric grid is extremely vulnerable to collapse due to cyber warfare, EMP attack, or solar flare (CMP). He came to the conclusion that a major attack on America’s power grid is not only possible but also likely. He found that the U.S. Government is completely unprepared due to a variety of economic and political reasons. Imagine a blackout lasting not days, but weeks or months. Millions of people over many states are affected. For those without access to a generator, there is no refrigeration or light. The sewage systems will cease to function. Gasoline is not available and even if it is, your car may not run. Food and medical supplies are running out. Cell phones and electronic devices have ceased to function. Banks no longer function, looting is widespread, and law and order are being tested as never before. If you have read the novel One Second After, Koppel agrees that this is a likely scenario. Lights Out is organized into three parts. The first part looks into the vulnerability of our power grids to a catastrophic attack. The majority of the experts interviewed by Koppel conceded that someone who has the right skills and knowledge can damage our power grids so that multiple states and their millions of residents can be simultaneously knocked off from the grid for a very long time. This could be a year or more, depending on how quickly replacements for damaged grid components can be manufactured. Many of the large transformers are no longer manufactured in the U.S. and a number are manufactured in China. Part Two, Lights Out poses the following question : What has our government been doing to deal with this possibility of a catastrophic cyber or other attack on our power grids? While a few in our government seem to be aware of the problem, no one seems to be doing anything to prevent it. “It’s not a question of if,” says Centcom Commander General Lloyd Austin“, it’s a question of when. Koppel makes clear, the federal government, while well prepared for natural disasters, has no plan for the aftermath of an attack on the power grid. FEMA is not prepared to respond to such a attack. Do not expert help from the government when one occurs. Part Three examines the efforts of individuals and some communities to become self-reliant when it comes to disaster preparedness. In Lights Out he discusses the efforts of the nation’s approximately 3 million preppers and some community and religious organizations. Koppel spent some time in Salt Lake City studying the Mormon Church preparedness plan. Koppel said of his visit to Utah. “Quite literally, you have an organization that is capable of producing food, processing food and transporting food to the degree that it really amounts to an almost governmental-like organization — except more efficient.” He suggested that we could all do some of the basic things that the Mormon’s do, including “establishing a minimum of a two- to three-month supply of food and water, setting aside extra money for an emergency, and building relationships with the community where people could share their skills and resources”. Now I know that most of you are aware of the problem and are working on preparing yourselves to deal with it when it occurs. But Lights Out may be a good nonfiction book to share with your friends and relations that still have their head buried in the sands. If you look at the right hand side of this page you will see a list of categories. Open the one called EMP and it will take you to everything I have written on this subject. Hopefully this information will help you, your friends and families. This entry was posted in electronics, EMP and tagged CMP and EMP, Lights out, Ted koppel. Bookmark the permalink. from sources i’ve read, heard interviews on radio, tv; if the government starts NOW the cost would be approximately $2 billion and it could be completed within several weeks ( or less) . enough experts have addressed this risk w/ the POTUS WHY DOES HE DELAY ? I’m sorry that I’m going to have to delete your blog from my feed today and stop reading you. Preparedness is not liberal or conservative. You hurt the cause of preparedness when you stereotype liberals as “hurting the country.” Is Fox News part of the liberal media, by the way? I’m a liberal, and I prepare and take full responsibility for me and my family. Other liberal people do too. I think you are too much a part of a bubble where you stereotype people who are different than you. So fine, live in your bubble. I will get my preparedness information from someone who doesn’t think liberals “hurt the country.” How insulting. I thought differing view points were part of America. This is how the liberals function; by taking things out of context to suit their ‘feelings’ and make up stuff to fill in the blanks. I say good riddance. Well done summary. I was wondering about picking this up. Looks like it’s going on my shelf. After retiring from the military, I spent 24 years in local government, all since 9/11 being detailed to Emergency Management work the public works side of logistics, critical infrastructure, transportation, communications and utilities, and the emergency preparedness, mitigation and protective measured piece of our Emergency Operations Plan post 9/11. I can tell you that all of what Howard has posted can be taken as Gospel. You are entitled to a differing opinion, but I can tell you from first-hand experience that head-in-sand liberals of mis-applied compassion will lead this country to destruction in failure to confront the enemy which surrounds us. This vulnerability is well known in the power industry. Some cities manage it better than others. Barring a stuxnet type attack that destroys power generation capacity, it’s a high probability moderate impact risk. The most likely attack profile results in about a month of power interruption, depending on the level of backup repair parts on hand. It would be unpleasant but not catastrophic for those who prepare for “all hazards;” but likely disastrous for anyone living in a city over 100,000 people which depends upon municipal infrastructure for delivery of power and water, and transpoirtation dependent “just in time” delivery at the grocery. The good news is we can work around it when it happens. Unlike an EMP event or major solar flare that would seriously damage transmission system; that’s not easily mitigated. I’ve been thinking long and hard about responding to this and here it goes. Mr. Koppel does not know what he is talking about and neither does any of the so called experts referenced in his book. This is fear mongering at it’s finest. Backup systems are in place, procedures and protocols are reviewed, tested, re-reviewed and re-tested again and again. Fail-overs to backup systems are done monthly some times weekly. The industry along with he government runs “war-games” all the time in fact a big one is being held just this month. The regulation that holds the industry to their internal controls are the most strict in the compliance world that when people outside the industry learn about them they can’t believe it. It’s not secret go here to read all about it and learn for yourself http://www.nerc.com/ The electrical industry spends billions to keep the bulk electrical system reliable and for people to say nothing is being done is pure fiction. Can something catastrophic happen yes, much like people could fly planes into skyscrapers. But trust me some of us out there work very hard to make sure the lights stay on. I had to stop and think about whether or not to post this, because based on the research I have done, I disagree with you. But I have been mistaken before and would like to learn more. So I am hoping this will lead to a discussion that we will all learn from. What is your background that leads you to this conclusion? I work directly with Critical Infrastructure Protection, it’s the CIP in the NERC-CIP regulations. I must stress my views and opinions are my own and do not reflect the views and opinions of my employer, the electrical industry, or regulatory bodies. However I work with a group of highly dedicated, talented, and intelligent people that work 24/7/365 days a year to protect the electrical grid from physical and cyber attack. Again to say nothing is being done is just not right. Also not just what we do as an industry but the work we do in conjunction with the government such as Infragard (disclosure I am a sitting board member of my states chapter) please go to https://www.infragard.org/ and have a look at the critical infrastructure sectors that participate and are dedicated to sharing information and intelligence to prevent hostile acts against the U.S. Many things are being done to make sure that the light stay on, and many new technologies are being deployed to help mitigate any type of natural or made made incidents to drastically reduce the occurrence of downtime to the bulk electrical system. The fact is the general public, and even old news anchors just don’t know about it. The answer is yes the industry is very concerned about EMP and CMP and technologies are in place, and being developed to reduce this risk. The NERC-CIP regulations cover both cyber and physical threats and are very intensive and detailed on what must be done to assure the reliability of the bulk power system. Again just my opinion but so few politicians even understand the actual risk that the only thing that they ever react to is the fear tactics the lobbyist for security companies present them….it’s all about the money. 1 Since the 1980s, our power grid control systems and information infrastructures have been growing in their reliance on the Ethernet and computers, which are much more vulnerable to E1 EMP than previous control and communications systems designs. Likewise, the power grid today is much more vulnerable to (E3 EMP) and solar storms than the grid of the 1970s and 80s due to the increasing network size and evolution to higher operating voltages. 2 “Report of the Commission to Assess the Threat to the United States from Electromagnetic Pulse (EMP) Attack: Critical National Infrastructures,” April 2008, page 181. This report presents the results of the Commission’s assessment of the effects of a high altitude EMP attack on our critical national infrastructures and provides recommendations for their mitigation. 3 Aurora-induced phenomena refer to effects like geomagnetically-induced currents in the power grid that are caused by solar storms which are associated with increased aurora activity. Although there are many different phenomena associated with solar storms, one of the most important is the geomagnetically-induced quasi-dc current flow that can damage our power transmission networks. 5 Robert L. Schweitzer, LTG (ret) USA, “Radio Frequency Weapons: The Emerging Threat and Policy Implications,” Eagan, McAllister Associates, October 1998; see also: Overview of Evolving and Enduring Threats to Information Systems, National Communications System, August 2012. 6 In the last 200 years, only the 1859 and 1921 solar superstorms are believed by experts to have exceeded the 4,000 nanoTesla/minute level over the U.S. If one of these storms were to occur today, many experts believe they would likely damage key elements of the power grid and could cause very long-term power outages over much of the United States. 7 To date (2012), 17 national level Emergency Alert System radio stations have been protected against EMP. Within the next year, another 20 national level EAS radio stations are planned to have EMP protection installed.